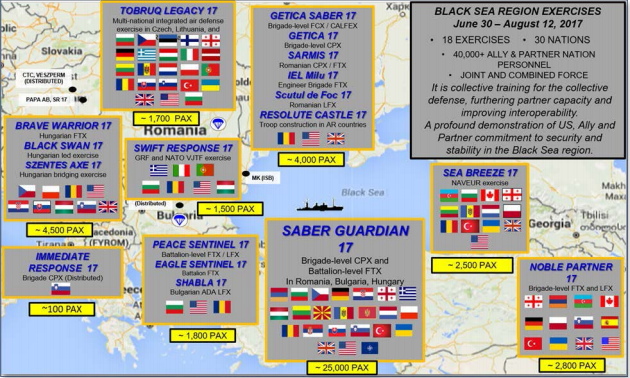 Strategic Analysis – Saber Guardian 2017 (SG17) is an annual, multinational exercise held in the Black Sea region as pat of the U.S. European Command Joint Exercise Program. This year’s iteration took place between July 11 – 20. The exercise’s aim was to assure allies and partners of the enduring U.S. commitment to the collective defense at the Black Sea region, to enable the Alliance’s command and control functions, and to reinforce deterrence measures agreed to by NATO allies at the Warsaw Summit in 2016. The exercise was organized by the U.S. Army Europe and co-hosted by Romania, Bulgaria and Hungary, that saw numerous drills and simulations taking place all over these countries. Approximate 25,000 troops participated in the exercise, while 14,000 of them being U.S.forces; the rest coming from member or partners countries of NATO: Armenia, Bulgaria, Czechia, Croatia, Germany, Georgia, Greece, Hungary, Lithuania, FYRO Macedonia, Moldova, Montenegro, Netherlands, Poland, Romania, Serbia, Slovakia, Slovenia, Turkey, Ukraine and the United Kingdom. Throughout this analysis we explore the Saber Guardian exercise through the ‘Swift Response’ mission that took place at the 71st ‘Emanoil Ionescu’ Air Base in the village of Luna, near Campia Turzii town, Cluj county (Romania), where Transylvania Intelligence was present obtain exclusive footage and information. Moreover, the massive military effort will later in this article be explained through the geopolitical lens as it relates to the Black Sea, as ‘Saber Guardian’ upholds its exclusive dedicated nature for this expanded region. Swift Response is a series of airborne operations and joint force entries that functions within the framework of ‘Saber Guardian’ and took place in Papa Airbase (Hungary), Bezmer & Shabia (Bulgaria) and Campia Turzii-Luna & Cincu (Romania). 1.For 3-minutes, eight AC-130’s parachuted hardware, supplies and logistics at 11.00 A.M., July 21st on a plain-field near the Airbase. These resources were to be collected by units already on the ground and be used in the airfield seizure. 3.Around 4.00 AM, July 22nd, the joint Romanian-US force conducted a dawn raid on the airbase that lasted 4 hours and saw the capture of strategic 71st Base. A Mass Casualty and Air Defense exercise at Mihail Kogalniceanul Airfield, Romania. Other parallel exercises that enabled and supported ‘Saber Guardian’ as presented by the U.S. Army Europe – see the last map. 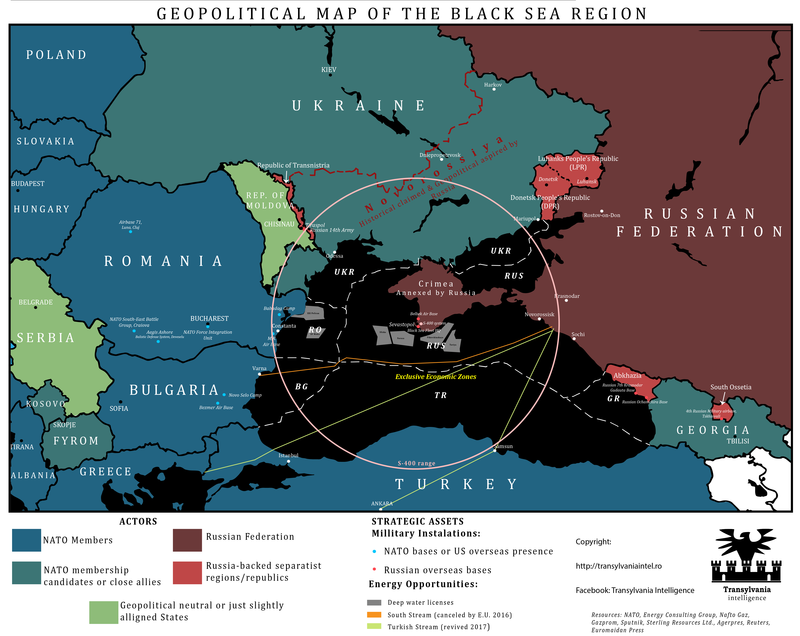 Black Sea Region: An emerging strategic vector? The Black Sea region has a unique tradition and history as a geopolitical entity. It was in the 18th Century when the Ottoman Empire lost its hegemony over this sea as a direct result of the Treaty of Kucuk Kaynarca (1774) that gave the Russian Empire access to its first warm water port in the Black Sea, and the status of protector of the Orthodox Christians living under the Sublime Porte. The Ottoman-Russian rivalry is directly linked to these area , and spilled-over to the Balkans and to the Caucasus, attracting external inputs that tried to maintain a balance of power in the region, or internal elements that marched to form their own states and movements. As it was the case of the Crimean War of 1853-1856, when France and the United Kingdom intervened in favor of the Ottoman Empire in order to defeat Russia and avoid a hegemony over the region by Sankt-Petersburg. The Black Sea was also a significant front in the First World War when the Ottoman Navy engaged the Russian ships stationed in Sevastopol. But while witnessing a declining importance in the Second World War, the Black Sea region essentially vanished as a geopolitical entity in the Cold War. The traditional Turkish-Russian balance of power disappeared and instead, a Soviet and Warsaw Pact hegemony was installed. However, the situation changed when the URSS collapsed, despite the Russian Federation’s desperate attempts to conduct damage control over its ex-territories. One one hand, Moscow saw how its strategic territories as Crimea taken away, how ex-Soviet Republics, as Estonia, Latvia and Lithuania, or ex-Warsaw Pact allies, notably Poland, Romania, became hardened Euro-Atlantists that integrated in NATO, the European Union and called for a significant increase of U.S. troops on the Eastern Flank. The critical ‘belt’ that Moscow looked after was its ex-Soviet Republics. While enjoying a friendly government in Kiev and Minsk for most of the time, the Romanian sentiment swiftly grew in Moldova upon assuming its independence in 1991, which triggered an immediate Russian invasion. While not managing to fully subdue Chisinau, a breakaway region was created east of the Dnister that would hold a perpetual leverage over the country. The Republic of Transnistira still hosts today thousands of Russian troops from the 14th Army. Similar interventions also took place in Azerbaijan (much more indirectly) or Georgia, a conventional invasion that sought to cripple the small republic’s future of joining NATO. After the Russo-Georgian War of 2008, two breakaway republics were formed under Moscow’s direct military and political foothold: South Ossetia and Abkhazia; these regions still host a number of Russian basses and thousands of troops eyeing Tbilisi. Then, came the 2007 cyber attacks on Estonia that crippled the country’s infrastructure. However, the Black Sea began to fully resurface as a geopolitical battleground when Russia lost Ukraine. After the radical decision by the Yanukovitch government to go ahead with the E.U. association protocol, protests from Moscow made the government reverse the decision, but instead stirred massive street movements in Kiev and all over the country. The crisis of 2014 escalated when the government began shooting at the over 1 million demonstrators in the main square of the capital. In support of the ‘Euromaidan’ movement came opposition parties, the United States and the European Union. And as Yanukovitch flew to Russia in an attempt to escape the angry population, it became clear the Ukraine was now radically driving out of the Kremlin’s sphere of influence and into the Euro-Atlantic one. Vladimir Putin ordered a seizure of Crimea in yet another attempt of damage control of it’s weakening influence. Under a strict political deniability complemented by an ambiguous informational campaign, topped by targeted cyber and electronic warfare, Russian forces stationed in Sevastopol alongside incoming troops from the mainland managed to encircle Ukraine bases in the peninsula. And under a mock-referendum guarded by the Russian troops and local separatist groups, the population of Crimea, indeed overwhelmingly ethnic Russian, voted in favor of uniting with the Russian Federation. The combination of international pressure and fierce resistance from Kiev, managed to cancel Novorossiya; at least for now. The self-declaration of ‘Little Russia’ (Malorossyia) as an independent state, made by the leader of DPR, Alexander Zakharchenko, draw hostilities (at least publicly) from the LPR and Moscow, dully because it might have been a sign of abandonment of the larger, grand project for a patch of stable influence. Althought Kiev is still facing with a fragile and status quo-friendly treaty, the Minsk Agreement 2, and a potential volatile breakaway territory in the east, it’s maintaining its path of Euro-Atlantisism; with U.S. forces regularly conducting joint drills in the western region and on the seaboard, while cooperation with the E.U. is unprecedented. The Black Sea region has recently emerged as a potential energy hub in regards to natural gas and even oil. The underwater deep shells have attracted interests from the biggest energy investors as Lukoil, OMV and Exxon Mobil to contract the licenses. After years of research and drilling, Romania’s maritime shell was confirmed and estimated at around 20 billion metric cubes of gas, enough to make the already energy sufficient country, a gas exporter. Together with Exxon Mobil, Bucharest will begin to exploit the deposit as of 2018. On the other side, Russian companies are already drilling into the shells near Crimea, and could have extended more if Odessa entered the separatist project, and would have changed the Black Sea’s exclusive economic zones in Moscow’s favor. Such a move would have offered Russia the opportunity to contest Romania’s maritime exclusivity and claim the deep water gas deposits thanks to an island, the Snake’s Island, that sits within the Romanian EEZ and next to XXI Pelican shell, but belongs to Ukraine. Additional military moves from Moscow are expected in NATO’s maritime perimeter. And as both Bulgaria and Romania suffer from an outdated, weakened and underwhelming military force, a stronger NATO presence is needed in the area. Romania’s sole objective at the 2016’s Warsaw Summit was to receive support for a Black Sea Fleet framework to be formed within the Alliance. Given Bulgaria’s opposition, skeptical of military build-ups in the area, Bucharest only received a multinational battlegroup in Craiova, formed by American, British, Polish and Bulgarian troops. But Washington’s aid had doubled in size in regards to military and political cooperation. Furthermore, the latest two National Security Strategies of Romania named as an objective for the country to become ‘a strategic vector of the Black Sea’. Saber Guardian, the largest exercise ever held in the Black Sea area was organized by U.S. Army Europe and co-hosted by Hungary (logistic hub for south-east Europe), Romania and Bulgaria. It massed 25,000 troops in additional to the already many ongoing exercises by NATO in the area. All the simulated scenarios tested, subjected crisis situations and responsive actions to aggression emanating from the Black Sea. It simulated how logistics could be swiftly transferred from the main U.S. military hubs in Germany, to coordination centers in Hungary and then to the hypothetical frontlines of Romania and Bulgaria. It tested and exercised inter-operability and battle-space versatility, in critical and diverse missions as: air defense operations, mass casualty situations, seizures and counter-offensives; taking place in diverse regional realms, from the Hungarian Danube, to the Romanian plains or Carpathian mountains, to the Black Sea’s ports or waters. Black Sea Area Support Team (ex- Joint Task Force-East), the operational unit within U.S. Army Europe, that deals with Romania and Bulgaria, had its most busy days from its founding in 2007. Together with local allies, it attempts to stop the maritime area from becoming a ‘Russian Lake’, as an ex-Romanian President once referred to Russia’s resurgent posture in the Black Sea. The region is one of the few that indeed resurfaced after decades of strategic ‘sterilization’ into a vital geopolitical vector. The Three Seas Initiative: Towards an ‘Intermarium’ under Anglo-Saxon protectorate? No Comments on The Three Seas Initiative: Towards an ‘Intermarium’ under Anglo-Saxon protectorate? ‘I’m thrilled to join you today, and I want everyone to know that the United States supports your bold efforts. […] America will be your strongest ally and steadfast partner in this truly historic initiative.’ Donald J. Trump, opening remarks at the Three Seas Initiative Summit, Warsaw, Poland on July 6th, 2017. (a) In the remote, deserted and extremely sparsely populated area of the Syrian Desert, notably around the tri-border area with Republic of Iraq and the Kingdom of Jordan, the impact of the civil war has been relatively moderate with rare high-intensity waves generated by intertwined moments or actions from other battlefronts. The area was sharply captured by ISIS since late 2014 in order to secure the supply lines from the loyal Iraqi region of Anbar in order to fuel military operations in Homs and Rural Damascus. Situation Report and Tactical Annexes – The Iraqi Security Forces (ISF) have issued an updated battle war suggesting a finalized phase for the months-long battle. The last western neighborhoods controlled by ISIS are equated by Bagdad’s estimates at 10% of the city. Operation “We Are Coming, Nineveh” (قادمون يا نينوى; Qadimun Ya Naynawais) is a joint ISF (Iraqi Security Forces)-KRG’s Pashmerga (Kurdistan Regional Government) effort supported by the US-led International Coalition ‘Inherent Resolve’ against Da’esh/ ISIS/ ISIL/ IS. The current developments where proceeded by Operation ‘Fatah’ that consisted in a series of missions that took place in mid-2016 with the purpose of clearing the way to Nineveh province (north-western Iraq). The actual assault on the city came around October 2016,and only after key operational assets have been seized (as the Qayyarah/Q West Air Base) in the Nineveh region, as well as having secured a southern supply line towards Baghdad. Co-extensively from late 2015 to late 2016 the Kurdish factions attributed to the Kurdistan Regional Government (KRG) in Iraq, such as the Pashmerga have cut the main supply lines from Mosul to the self-declared capital of ISIS, Raqqa, through the border crossings, but namely via the Sinjar Mountain. Given these multilateral and key military achievements, which are expanded and explained in-depth in the video below this text, we have reached a crucial moment in the fight against ISIS. (1) The security landscape in South Asia and the Far East is continuously degrading under transnational militant activity and competing geopolitical Chinese and Russian ambitions. (2) The fugitive US pull-out has accelerated the Taliban’s resurgence and has fertilized the ground for other third parties to enter the stage. Some of these parties is the local franchise of the Islamic State of Iraq and al-Sham (ISIS), additionally named “Khorasan Province” or generally addressed in the Euro-Atlantic community as “ISIS-K”. Khorasan is the historical generic term that refers to the region of western Iran to Eastern Afghanistan and holds great value for the Islamic civilization both historical and dogmatic, as Khorasan is subjected in several Hadiths as where the “black flags rise” to establish the Calipath, a prophecy largely capitalized for PR purposes by many militant Salafist groups. The current Transatlantic vital security interests in the regard to the Afghan war. “It had once been under the authority of Muslims, along with the regions surrounding it. Afterwards, the secularist…the cow-worshiping Hindus and atheist Chinese conquered other nearby regions, as is the case in parts of Kashmir and Turkistan,” In addition he offers a sneak peak to the growing Taliban-ISIS tensions in the area, considering the Pakistani Intelligence manipulators of Islamists and the Taliban’s as an obstruction to the a Caliphate in Afghanistan. Throughout the years we will come to learn extensively of how ISIS perceives the Taliban, namely as a “nationalist jihad” – Inherently due of their ancestral Pashto tribal code of conduct known as Pashtunwali, prioritized over the confessional one of Sharia Law, and also due to their lack of expansionist ambitions to India, China and the surroundings. Accurately described, the Taliban settled for a national liberation movement throughout Afghanistan with limited engagements in Pakistan that in effect had more to do with the first objective rather than a regional outlook, while being deeply rooted in local tribal affairs and catalyzed within the societal layers through their ancestral customs, identity and configuration. In effect, ISIS-K has shown great hostility towards the tribal system throughout the Afghan mountains which indirectly fueled the population’s dependency on the Taliban for security yet again. Tribal leaders were beheaded and villages were terrorized if they didn’t submit to Da’esh. This is a practice that ISIS-K has continued to echo regardless of its lack of pragmatism or rationally notably given the context of the human deficit that the local branch faces. In the beginning ISIS-K quickly gained support among other disenfranchised Taliban (especially Pakistani) fighters as the founders themselves, intrigued by the allure and successive victories of Da’esh in the Middle East. However ISIS-K remained in the eyes of the locals as a foreign construct with no presence in Afghan history and huge hostility towards local customs and affairs. Per contra, ISIS-K manages to win the alliance and partnerships of other “underground” Islamists groups that were looking for a way to challenge the Taliban’s hegemony, as the Islamic Movement of Uzbekistan. The malign, mosaic and fast-shifting expansion of ISIS-K on Afghan territory was based on the established militant cross border networks stretching from the Afghan eastern provinces of Kunar and Nangarhar, where many T.T.P. militants had settled following Pakistani military operations in North Waziristan Agency, all the war through north-eastern FATA and Peshawar. While the Afghan Taliban resurfaced in the traditional Pashtun areas, far from the country’s center but concentrated on periphery, mountains and border crossings. ISIS-K Emir Hafiz Saeed Khan and his associates utilized this model that established ISIS-K as worrying presence on the war map, securing a presence in over 11 provinces, even if those had little significance on the ground. As a guerilla structure based on a asymmetrical nature, ISIS-K could not survive long enough to develop hybrid characteristics as the central branch in Syria & Iraq, surely due to the lack of local support and rival clashes. ISIS-K has continuously faced these major operational obstacles that have proven to be more damaging than any conventional military campaign. In addition, unable to effectively blend within the societal fabric, ISIS-K members became much more easily to track, both for the Taliban and the United States/ Afghans. A mentionable influx of Pakistani Taliban came in middle-2015 due to several offensives launched by the Pakistani Armed Forces in the bordering area of FATA. In face of the aggressively growing foothold of ISIS-K, the Afghan Talibans sent their best fighters in the eastern mountains of Nangarhar that waged long and violent military campaigns. U.S. Secretary of Defence at that time, Ash Carter described IS presence as ‘little nests, of small rural isolated and dispersed incubators, that could flourish towards urban settlements, as Kabul and Jalalabad. According to former commander of NATO and U.S. forces in Afghanistan, General John Campbell, IS was acting on a strategy to “move into the city of Jalalabad, expand to neighboring Kunar Province and eventually establish control of a region they call Khorasan.” Those being the exact provinces were ISIS-K still holds a consistent presence. ISIS-K Emir and Founder, Hafiz Saeed Khan has been reported killed at least four times, the most recent in a U.S. drone strike in January 2016. Sheikh Gul Zaman al-Fateh, Khan’s second-in-command, and spokesman Shahidullah Shahid were killed in a drone strike in July 2015. The police chief of Helmand said that former Taliban commander Mullah Abdul Rauf and ex-Deputy of Saeed Khan, has been killed in a NATO drone strike in February 2015. Incumbent leader of ISIS-K, Sheikh Abdul Hasib was killed on May 8th 2017 by the US Army’s 75th Ranger Regiment in a combined ground/air raid in Nangarhal. complex relation between Afghan Taliban and Pakistani Taliban, the future of ISIS-K allegiance towards the later is open for speculation, even though that implies to move under Pakistan’s Deep State, were a vast array of security institutions and actors would provide a constant flow of logistics and a stable sanctuary in the area, with the price of submission and surveillance. As expected in face of diminishing control and presence, ISIS-K launched a series of attacks against Afghan, US installations and civilian targets throughout the country; actions rivaled by similar Taliban operations in order to maintain the relevancy in terrorism practices and project power. On March 8th 2017, gunmen dressed in white hospital robes stormed the Sardar Daud Khan Military Hospital in Kabul, killing over 100 people. ISIS-K indirectly claimed the attack through the Amaq Agency but Government officials had reasons to suspect the Afghan Taliban Haqqani Network instead. Throughout 2016 to 2017 Afghanistan began to be hit weekly if not daily with low-level attacks against civilian and military targets alike. According to US watchdog SIGAR, casualties among Afghan security forces rose by 35 percent in 2016, with 6,800 soldiers and police killed. With a slighter less robust counter-insurgency approach, the United States has actively tasked Special Operators to capture or kill leading high value targets (HVTs) in the area. In March, one such operation in Nangarhar ended with the death of a Green Beret. However, his death was not in vain; thanks to the human intelligence collected through a deep-behind-enemy-lines reconnaissance they have discovered a vast network of underground tunnels going through a mountain in Nangarhal; through this cave-system ISIS-K hosted dozens of fighters and maintained a regional control & command outpost. The US CENTCOM (Central Command) determined that the mountain was too dangerous for an infantry-based sweep & clean mission that would put in additional American lives in harm’s way, therefore the operational solution remained an air force one. On April 13th 2017 CENTCOM announced that they have dropped for the first time their biggest non-nuclear weapon in the arsenal, generically named “MOAB – Mother of All Bombs”, the GBU-43 Massive Ordnance Air Blast Bomb was the most suitable choice, being developed exactly to destroy underground facilities such as missile-silos, bunkers, or tunnels in this case. According to Afghan officials the blast neutralized 94 ISIS-K fighters and destroyed most of the tunnel network. Going beyond the strike’s operational role for the Afghan theater, this action was undoubtedly an embedding geopolitical power projection with international ramifications: in the context of US-North Korean tensions, but also for other actors lined up for opportunities in Afghanistan. the military phase would focus on seizing more areas and carrying more attacks in the form of coordinated attacks, guerilla attacks, suicide bombings, insider attacks and target killings. An additional problem in the Afghan situation is the external now-found openness towards the Taliban. Russia, Pakistan and China are actively attempting to legitimate the movement and bring it to the negotiations table. Beijing’s geo-economic “Silk Road” project and Russia’s resurgence attempting to erode US influence will continue to have an impact on the transnational stage of the Far East. In February 2017, Russia, Pakistan and China agreed to start an outreach for reconciliation with the Taliban. New Delhi and Kabul registered their protest with Moscow, which led to an invite to the conference for the two countries, along with Iran held in Moscow. India and Afghanistan wanted these countries to respect the provisions of the UN Security Council Resolution on terrorist groups. Russia, Iran and Pakistan agreed to respect the international red lines but refused to end the ongoing channels of talks with the Taliban. The United States, which was no invited to the conference, has reasons to believe that Russia manifests interest in the Taliban in order to harm the US effort in Afghanistan, camouflaged under the standard of “combating ISIS”. Chinese, Pakistani and Iranian interests align in context of Beijing’s ‘One Belt, One Road/ Silk Road’ initiative that would not only traverse their respective countries, but the Taliban-held territories as well – reason for stimulating communication channels with the jihadists. In 2016 a delegation led by Abbas Stanakzai, head of the Taliban’s political office in Qatar, visited Beijing on July 18-22 at the invitation of the Chinese government, a senior member of the Taliban said. In addition to the prospective geo-economic interest, the Chinese government is faced with its own Islamic insurgency in the northwestern province of Xinjiang, where a strong jihadist movement blessed by both al-Qaeda and ISIS is continuously aided by transnational and regional militant groups some of who are also rooted in Afghanistan. The Beijing-Islamabad bond is even stronger on the regional issue, where besides the historical military alliance in the context of Cold War and Pakistan-India rivalry; they share a common strategic project. In an effort to diversify the “Silk Road” project, China has crafted several visions that include the usage of maritime ways and accessing major ports located in proximity of relevant regions. The China–Pakistan Economic Corridor or OPEC is the embodiment of this doctrine being estimated at 62$ billion. China is working to boost Pakistani road and railway infrastructure traversing the country’s territory from the northern common border to the southern port of Gwadar whilst expanding it to host and sharply export large volumes of goods and merchandise. It goes without saying that such a massive investment needs protecting and given Pakistan’s security environment, the Taliban’s are a key player to the development of this project. Beijing hopes to secure their non-aggression via Islamabad; we have reason to speculate that as rumored even during the US War from 2001 onwards, the Chinese will intensify ammunition and weapons transfer in exchange for security and non-aggression. Nonetheless, the project also traverses the southern region of Baluchistan were militant activity is not only high but densely fragmented and out-of-state control. In addition, the geopolitical balance of the Pakistani-Indian equation is as needy as ever for Beijing, as New Delhi can stir turmoil at the border area and in Kashmir, which would again threaten Chinese infrastructure. Whether this context and dynamic will prove to be deal-breaker or a challenge for Chinese strategic ambitions it remains to be seen, what’s clear is that Beijing is looking into risky options to contain the threats and facilitate a fragile geo-economic-oriented stability. In a similar mindset, the Kremlin is attempting to secure a seat at the Near East table by exaggerating their regional and international power and impact in order to erode US strategic interests and to possibly develop energy projects for to the gas-rich markets of South Asia. Once again, Afghanistan and Pakistan represent a quick route towards the large populations in the Indian Subcontinent: India, Pakistan, and Bangladesh. They believe that supporting the Taliban would serve best their interests: degrading the US-backed political establishment in Kabul, combat ISIS and secure at seat at the regional table. Yet, Russia of 2017 is not the same with the Russian Empire in the 19th Century where similar arrangements were being done against the British nor the USSR in the Cold War where a large military intervention could be accomplished to overthrow the establishment. As history showed, a soft power approach to the barely governable, tribal lands of Afghanistan is a zero-sum game, notably when it involves supporting radical factions as proxies or elements of stability. On the outlook, Russia will fail in its strategic objective; however the short-term effect generated by the Kremlin aid for the Taliban will have tactical consequences meaning more targets for the Pentagon and a higher risk for governance over Afghanistan. The Pentagon is expected to submit a new strategy for Afghanistan surgically planned by the incumbent Secretary of Defense James Mattis. Without a doubt Washington is faced with a crossroads of global engagement that has great ramifications for this region as well. Up to now, the Trump administration has proven to be more interventionist and inserting than the past one, being close to the Bush era course of action. Therefore we have reason to think that this new strategy will follow the newly established line of doing whatever it takes to counter-balance regional adversaries trying to conventionally or subversively assert themselves in Afghanistan, but also to defeat ISIS in the region an additionally erode the Taliban’s resurgence. In Afghanistan as in Iraq the ‘blitz’ retreat and the signs of global disengagement of the Obama administration crafted a vacuum that proved to be fertile enough for degraded foes to quickly arise and challenge the US constructions. Another dramatic consequence of the US pull-out was the loss of trust from local allies that risked so much to support Washington’s projects and lost so much when they left, leaving them exposed to Taliban revenge. Similar to how the post-2012 situation developed for the Sunni tribes that raised against al-Qaeda in Anbar, and that were later left alone and exposed to AQI retaliation and Baghdad’s Shi’a persecution. (1) The United States needs to maintain Afghanistan as a strategic outpost in the War on Terror, even if that means launching a medium troop surge (3,000 – 6,000) to conduct surgical operations in needed regions and on tailored objectives, which could go beyond JSOC boundaries and expand to more regular infantry corps to project presence and re-assert the US military in the area. These troops could continue the mandate’s tradition and be largely provided by NATO countries. (2)The NATO Resolute Support mission should consequently be extended and expanded in a framework where a great emphasize is put on developing the Afghan’s Army logistical capabilities, notably strengthening the Afghan Air Force. A powerful and robust Afghan Air Force will have a strategic impact for Kabul to expand their power projection and governance-reach in tribal lands and mountains. Such an asset will also provide them with the position to be first responders and to assert itself as a security provider and not just as a receiver. (3) In face of growing geopolitical challenges from competitive states, the United States should go beyond a friendly partnership with Islamabad and alter the regional dynamic will attempting the long awaited ‘Indian pivot’. While not abandoning Pakistan as the major Afghan partner, the ambivalent and deceiving nature of their Deep State security apparatus needs to be addressed in a resolute manner. Consequences should be inflicted. (4) The ‘winning the hearts and souls’ protocol should remain the main population-based COIN correlated in contrast to the military solution as an integrated asymmetric response. Because a guerilla group cannot survive without support from the population, counterinsurgencies are as much about winning over local populations as they are about the military defeat of insurgents. (5) The financial aid should be maintained; notably referring to the NATO-run Afghanistan National Army (ANA) Trust Fund, the UN-run Law and Order Trust Fund for Afghanistan (LOTFA), and the US-run Afghanistan Security Forces Fund (ASFF). Another great further reading on counter-insurgency through infrastructure we recommend this paper from ETH Zurich. (7) Continue a HVT-centered campaign against Taliban and ISIS-K leadership; while many see this as un-effective given a guerilla’s flexibility on the “top-to-bottom” chain of command, there have been proven instances where the KIA of HVTs resulted in a direct weakening of the entire structure: see Osama Bin Laden-Al-Qaeda or even the Taliban after Mullah Omar’s death in 2013. In effect, a permanent drone campaign operated by the CIA should not only be maintained but boosted. (8) Necessity of re-assessing the US counter-narcotics strategy towards Afghanistan in a bid to degrade the Taliban’s financial income from opium trade. 92% of the world’s opium demand comes from Afghanistan, and with the topple of the Taliban government, the market was consequently opened for a mosaic of militant or mob-like groups ready to capitalize on the Taiban’s loss of control over most of the fields and consequently the erosion on the Taliban’s harsh rules over the trade. Still, they managed to regain the opium-rich regions of southern and eastern Afghanistan, which in correlation with control of the border crossing also makes the Taliban an intricate network of drug-trafficking, both as production and as protection of trade routes – corroborated by Ann Patterson, U.S. Assistant Secretary of State for Narcotics and Law Enforcement, an Kabul Police Anti-Criminal Branch report and by Muhammad Daud, former governor of Helmand Province. However, until the civilian population is not faced with an actionable alternative source of income they will continue with poppy trade that finances terrorist activities and the Taliban will remain the main “job creator” for the Afghans. And at this stage, the narcotic issue cannot be simply solved through law enforcement or border control. More about the US counter-narcotics strategy in Afghanistan and the opium trade in the region at this analysis from the Strategic Studies Institute of the US Army War College. (9) The border issue remains one of the largest source of insecurity, remaining largely ungovernable and tribalized, militants can cross between jurisdictions easily while Coalition forces are faced with a sovereignty blockade that stalls and slows the process of targeting them. Un-sanctioned intrusions in Pakistani air space and territory remains a bed-rock of the black operations launched by JSOC or CIA, yet the overall situation still orbits around the unrestricted cross-border flow of jihadists and the Pakistani national restriction. While in the past it was needed to keep the border open for NATO supply lines coming for Pakistani port and airports, at the current troop numbers in Afghanistan logistics could probably be provided solely through local airfields? – Open question – if so, a “closing the border” strategy could become realistic in planning, even though the implementation remains largely difficult. It goes without saying that the list goes on, these guidelines barely being the top of the iceberg in regards to the regional situation. However given the public’s growing interest in the ISIS-K activity in Afghanistan rivaled by the Taliban’s resurgence but also of the geopolitical game, Transylvania Intelligence considered such an analysis as being suitable for presenting an Euro-Atlantic strategic paper on Afghanistan and the Far East. We shall now wait for the Pentagon’s new Afghan strategy, largely expected and realistically needed to call for a troop surge and an advancement of US/NATO operations in the area. The loss of US presence and influence throughout the world is the strategic tendency that the Trump administration has inherited, and in order to preserve the American Century and to promote the Euro-Atlantic interests, a strong tendency-reversal is inevitable and needed. STRATEGIC ANALYSIS – In order to comprehensively approach the North Korea problem, a glimpse into the past is needed. The Cold War that stretched from the immediate post-World War II period to the fall of the Soviet Union and the Berlin Wall holds the origin and the inception of the North Korean problem. In contemporary times, the regime from Pyongyang through its pursuit of nuclear armament has become an international threat and a troubling issue for the Asia-Pacific security complex. Moreover that the conventional capabilities of the North Korean Armed Forces are able to target and inflict devastating damage to South Korea and Japan – the major US allies in Asia and one of the leading nations in terms of economy and technology. Yet the web dynamic goes further to China and Russia, the main backers of the Kim dynasty in the Korean peninsula, who have traditionally opposed though sanctions on the Communist state and are openly sustaining the country’s economy by a trade relation exclusively bounded into a geopolitical idea. And that’s precisely why the North Korean issue has remained unresolved, due to its geopolitical weight, deeply rooted in the second half of the 20th Century. 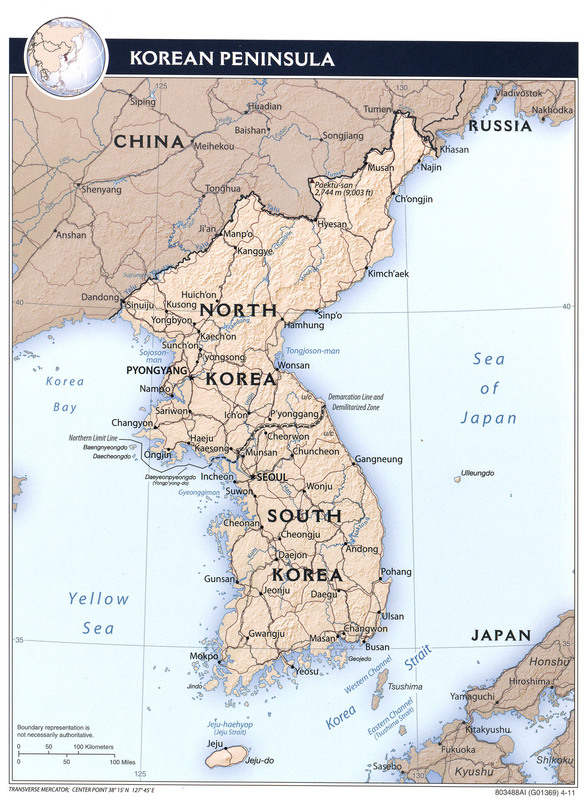 Following the Japanese surrender at the end of World War II in 1945, Korea was divided into two zones along the 38th parallel by the United States and the Soviet Union, with the north occupied by the Soviets and the south by the Americans. Moscow’s interest in extending its influence in the Asia-Pacific is well know, and as Nazi Germany fell in Europe, Stalin quickly shifted his attention on Imperial Japan, as promised even from the 1943 Tehran conference. There has been even a wide debate through academics of whether the Hiroshima and Nagasaki blast were also keen as leverage against Soviet interests towards Japan and the Pacific region, urging the American need to quickly crumble the government in Tokyo and initiate an US-oriented political regime. In August 1945 the Soviet Union engaged in a short but steadfast offensive against the Japanese, occupying Manchuria and carving a way towards the Korean peninsula. The northern half received after the surrender of Japan was an unexpected geopolitical win that has shifted the post-WW2 order in Asia-Pacific until this day. However, it wasn’t the USSR who continued to back the state establish north of the 38th parallel, Democratic People’s Republic of Korean (DPRK) or North Korea, but China; another major Communist state that was aspiring towards regional hegemony, which would later bring the two “red states” competing against each other (Sino-Soviet Split). The geopolitical emergence of China began with the victory of the Communist guerillas led by Mao Zedong in 1949 taking over Beijing, and then continued to be amplified by the strategic mistake of Joseph Stalin. The Soviet dictator had a saying: “one’s power is as long as its army can go”, yet when the Korean War was about to being, and Kim Il-Sung requested permission to invade the South, Stalin initially refused. Swiftly was China grated the opportunity to act. Mao Zedong approved Kim Il-Sung’s aspiration and additionally promised to send troops to support his campaign. Later on, Stalin changed his position as well, realizing China’s gamble. Yet Stalin’s engagement in Korea was limited, by having only non-combatant military advisors on the ground, especially because he wanted to avoid confrontation with the United States, and therefore lost influence and power over the regime in Pyongyang. China on the other hand continued to capitalize on this weakness, or rather, strategic boundary that limited the USSR, sending thousands of ground troops in a combatant role to support the DPRK army in any way needed. The invasion initiated by North Korea led to the Korean War (1950–1953). 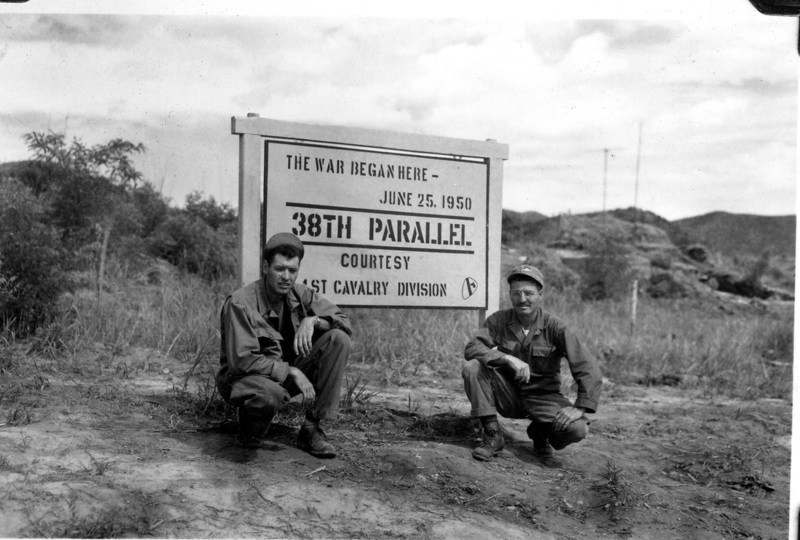 After three years of fighting to repeal and defeat the DPRK invasion, the Korean Armistice Agreement was signed on July 27, 1953. In effect, there was only a ceasefire that followed, and no peace treaty; the hostilities continued at a lower intensity. Theoretically speaking the two countries are still in a state of war. Yet, China saw the potential in building a stead-rock regime in Pyongyang which would issue threats that Beijing couldn’t, which could directly threaten US interests as China wanted to publicly avoid. The Chinese have also developed a strong leverage over the North Korea government, involving trade, energy and technology. The isolated DPKR relies on Chinese imports to maintain its economy, on Chinese technology to keep its military capacity up –and-running and on Beijing to maintain a diplomatic shield over the Kim dynasty, outside as well as inside – against tempted generals to take power. Over the years and following China’s global engagement and strong trade relationship with the US, Beijing’s doctrine over North Korea remained the same, yet a rather unexpected situation occurred. Following Kim Il-Sun’s death in late 2011, his son, until then kept hidden from international eyes, has emerged to power. Kim Jong-Un has boosted the government’s pursuit for nuclear weapons and has intensified its aggressiveness towards US strategic interests. The Nuclear bomb is perceived by the regime in Pyongyang as being an existential element of retaining the country’s sovereignty, capitalizing on the MAD theory (mutual assured destruction) that deterred the aggression of one nuclear nation over another throughout the Cold War. DPKR (North Korea) has managed to develop fully functional nuclear weapons, but it has starved its whole population in the process. However, the defensive capacity is strongly disputed given the frequent provocations against South Korea, Japan and the United States. Subsequently, the development and testing of long-range ballistic missiles makes the nuclear program as offensive as possible. The Taepeodong-2 and KN-08 (Rodong C) are capable of delivering a 1,000 kg neutron bomb as far as America’s western coast, posing a direct vital threat towards the homeland, in Hawaii or Pearl Harbor. Hwasong 5 and 6, tested and fully-functional are already capable of hitting targets in Japan and South Korea, where taking aside the civilian factor, are also US strategic bases. As we can conclude, the North Korean problem has been growing harder to address, both because of the US strategic patience and due to China’s loss of grip over Kim Jung-Un. Both US President Donald J. Trump and Chinese President Xi Jinping have agreed on this issue, and Kim Jung-Un has credible concerns in regards to it. The North Korean dictatorship is not only a Communist hellhole and a totalitarian state, but also the only country that did not completely de-Stalinize. They did not catch the cvasi-reform period that occurred in the Iron Curtain during the 50’s and 60’s, being quickly taken under China’s grip who had no interest in reforming, thereby weakening, a servile and obedient dynasty. According to the CIA Factbook, DPRK’ has one of the world’s most centrally directed and least open economies, facing chronic problems. Industrial capital stock is nearly beyond repair, the agricultural sector is weak, due to collective farming practices, poor soil quality and lack of needed technology or fuel. Large-scale military spending draws off resources needed for investment and civilian consumption. The mid 1990s were marked by severe famine and widespread starvation. Significant food aid was provided by the international community through 2009. Since that time, food assistance has declined significantly. In the last few years, domestic corn and rice production has been somewhat better, although domestic production does not fully satisfy demand. A large portion of the population continues to suffer from prolonged malnutrition and poor living conditions. In addition, few sustainable solutions have been undertaken, the country remaining fully underdeveloped, with a total political control over its affairs and isolated from transnational projects that would include the DPKR in an economical zone. In addition, the almost inexistent trade relation is overwhelmingly depended on China; up to 75% of exports goes to China, while the country imports come 76% from China and 5,5% from Congo. The 25 million population, weakened and in deep poverty are subjected to an ideological and political repression that goes beyond the traditional personality cults found elsewhere on the globe, transcending to an almost messianic embodiment of defunct Kim Il-Sung, whom remains the Eternal Leader of the country. Given the monopolization of state power, even in a Communist state, Beijing has swiftly realized that Kim Jung-Un no longer fits its interest and also no longer abides by them. The government in Pyongyang has also developed awareness on the potential effects of its rogue behavior in regards to nuclear and ballistic developments. Consequently, Jung-Un began preparing for the worst from his enemies and “ex-friends”. He has initiated a purge within his family, party and armed forces, that began with 2012 and escalated in 2016 after he even restructured the party’s leadership positions. His uncle, brothers, sisters and officers were executed in a disclosed manner to send a message to both external threats but also internal silent opponents. In this way, he gradually but firmly declared war those who intend to depose him from this “rightfully” and hereditary throne. Both Washington and Beijing realized the scope of Kim’s paranoia and aggressive contingency actions, therefore plans were put in motion. Maintain Chinese influence in northern Korea in balance with the security concerns of US and its allies. However, China was always skeptical, fearing to not make a bad deal, giving up a disobedient, yet anti-American regime in Pyongyang, for a liberalized, but possibly leaning-American one. Therefore, Beijing inclined for a half-measure: continue the dynasty but bring a different Kim in charge. That’s precisely why Kim has launched a purge over his relatives, to prevent such an action, being well aware that his relatives, as long as they’re alive will pose a perpetual threatening competition. Beijing was quick to punish the regime, and has already began imposing “masked” economic sanctions that are highly representative by yesterday’s episode, when the coal transports traditionally imported by China, where refused and turned back to North Korean. China’s favorite candidate for the throne in Pyongyang was Kim Jong Nam, the incumbent’s half-brother that lived overseas. As a consequence, he was publicly assassinated on February 13th 2017 by two DPRK Intelligence operatives at Kim’s order in Kuala Lumpur Airport, Malaysia. Lawmakers and intelligence officials from South Korea also acknowledge this fact. The kill-op has left Beijing without its top candidate for a regime change, an action that Kim hoped to continuously secure his place, which almost did. But the death of Kim Jong Nam also benefited the United States. Washington would prefer to completely terminate the dynasty, launch a de-Kimification process and install a general, supported by the DPKR Armed Forces to lead the liberalization of North Korea. From there on, Chinese ambitions could be curved and US interests inserted. External-made regime changes have occurred in the past, but never in regards to a nuclear state, therefore, be advised, we are now on hypothetical territory. Such an undertaking would involve military pressure, sterile or active, political opportunity within the state and a strong international will go to all the way in forcing a nuclear nation into submission. After 8 years of Obama’s strategic patience, which is a sedative for “doing nothing” we came to realize that the Kim dynasty will not give up their nukes on their own, and that throughout this time, DPRK’s offensive capacity has become much greater. The United States has tried diplomacy and then coercion; the very limited non-military options have gradually proven their sterility. It has now hit a critical level. North Korea has a stockpile of strategic nuclear weapons and the means to transport them to their target; imminently , now in testing, the ICBM’s will also be able to hit the US coast. Furthermore, an additional fear is that of a “nuclear domino”. That the day DPRK has the capability to hit the US with their own ICBM, Iran will also have it for the right price. It will sharply and dramatically curb and degrade the United States, exposing it further to threats and facilitating a nuclear multi-polar world – a type of international order proven throughout history as being the most unstable and war-leaning. In that moment, the end of the American century will commence. The threat of North Korea cannot be postponed again. The regular US military drills in cooperation with South Korea and Japan, as well as the permanent military installations on the territory of the mentioned states, do provide the Pentagon with actionable resources to commence any political decision to be translated into military effort. Furthermore that the pivot in Asia-Pacific began late by the Obama administration does provide for an increased US presence in the region. The strong-act put up by Donald J. Trump during Xi Jinping’s visit at Mar-a-Lago, bombing the Syrian regime while casually enjoying a desert, spoke volumes to Chinese, Russians and North Koreans. It suggested that the current US President will not act publicly in regards to America’s strategic intentions, and will hold a high degree of unpredictability in regards to foreign and defense policy. This alarmed President Xi, forecasting that the US might even act alone, if he’s not on board, which could have devastating consequences for Chinese influence in the Korean peninsula. In the end, this has facilitated a common position from the two countries on the North Korean issue, and the above-mentioned regime change deal in principal. The USS Carl Vinson aircraft carrier is already in Korean waters, hosting dozens of airplanes including F-22’s and F-18’s. Strategic bombers, including stealth planes, are stationed in the Guam airbase, staged just 3,400 km from North Korea – a distance that can be easily traversed by the B-2. Capable to travel up to 19,000 km with just one air refuel, and costumed to bomb from a tall-altitude such as 15 km, the B-2 Stealth bomber is America’s favorite nuke-to-go plane. It can virtually enter denied airspace and successfully neutralize an enemy’s strategic assets, such as ballistic missile silos that would conceal the enemy’s offensive strength, nuke and ballistic missiles. The MOAB (“Mother of All Bombs”, firstly used in combat just yesterday against the “islamic state” insurgents in Narnarghal province, Afghanistan, is the biggest non-nuclear ordnance that the Pentagon has at its disposal. This strike destroyed an underground tunnel infrastructure was also fired in retaliation for the killing of a Green Berate. In addition, the MOAB is also the preferred weapon to destroy bunkers and underground silos; the same that an enemy would also use to store ballistic assets. Surely that the strike speaks volumes in Pyongyang; it echoes as a war-cry surely perceived overseas. The WC-135, also called the “Nuclear Sniffer” has been detached in Okinawa airbase since April 13th. This is a special-purpose aircraft capable of collecting samples from the atmosphere with the purpose of detecting and identifying nuclear explosions. Dozens of fixed wing F-18’s also stand on guard in America’s largest military installation throughout Asia-Pacific, the Kadena Airbase in Okinawa, Japan. They are ready to swiftly react and generate air combat in case one of its assets monitoring North Korea will be attacked. In the case of a hypothetical yet possible military option from the US against the Kim regime, preemptive action is vital for the safety of America’s allies. If not, nukes can fly all over the region, targeting Tokyo, Seoul or US ships. However, the Pentagon has placed a THAAD in South Korea, a United States Army anti-ballistic missile system which is designed to shoot down short, medium, and intermediate range ballistic missiles in their terminal phase using a hit-to-kill approach. It is a state-of-the art piece of military hardware, which should protect allied airspace without many concerns as the DPRK does not hold the capacity to launch a saturation strike, firmly because their nuke stockpile as their ballistic transporters are in a limited number, most of them with questionable functionality. The US should have the first strike initiative, bombing the nuclear silos using strategic stealth bombers, crippling their capacity to threaten allied nations. This would destroy Kim’s nuclear leverage and supposedly alter his decision-making. In effect, negotiations should be expected from China’s behalf, trying to convince Kim to either abide or leave. Yet, the decades long indoctrination and properness for war makes the conflict hypothesis moderately-likely. US operations should continue. Cruise missiles, the fan-favorite Tomahawk, should be the first and foremost assets used before any conventional air campaign would be launched, purposely to avoid putting US pilots and assets in harm’s way by operating in an armed hostile airspace. Tomahawks should level the anti-air defense system, notably the coastal infrastructure which would provide a great operational flexibility for starters. Successively, the cruise strikes should dig deeper and deeper in DPRK territory to eradicate the rest of anti-air weapons, so that US jets can swiftly take flight and impose a no-fly zone, which would again degrade any offensive capacity from the DPRK. Any North Korean aircraft taking off or in-flight will be grounded, with the possibility to conduct strike missions on major airfields for preemptive reasons. However, such an undertaking could take days, if not weeks, a time in which China’s supposed leverage, which would involve ground troops, should pressure Kim by moving towards the border bringing him at the negotiations table – yet, that is NOT the only way of going around. Ideally for the US would be that following the B-2 preemptive strike, or the cruise & air campaign, elements within the military leadership would realize the consequences of this action and the imminent annihilation of the North Korean state if Kim is no stopped would step-in and topple the government. Realistically, this could have several following scenarios, stretching form a successfully coupe d’état, to a civil war fought between loyalists and revolutionaries, that could manifest as a conventional confrontation or an insurgency turned into a proxy war. In this case, the Chinese alignment could alter, forcing it to support the loyalists and not the revolutionaries which would clearly be mainly US backed. Keeping the unity of the state and political structure is pivotally important for achieving a stable post-conflict resolution both for US interests and regional security. Given the racially homogeneously and confessional uniformed nature of the population, the socio-cultural factor would not play a major part in the post-conflict resolution, as it would be the case of a Middle Eastern country. However it is imperative to have as little as power vacuum in country as possible – this is a dangerous uncertainty in any regime change case. Traditionally in communist dictatorships and not only, the armed forces play a major role in the post-liberation phase. Subsequently, it is imperative to have a ready replacement to assume office while retaining as much of the political establishment and military loyalty with it. The boiling point: The “Day of the Sun” or “Diua de la Muertes”? Saturday April 15th is the biggest celebration in DPRK, the “Day of the Sun” or Kim Il-Sung’s birthday. A grand military parade traditionally takes place in Pyongyang, which this time can be camouflaged march to war; consequently, a show of strength is also being featured by launching ballistic tests. In contrast to previous celebration, this year an unwelcomed guest resides in the Korean water, which is the US strike group composed by the USS Carl Vinson and several Tomahwak “open carrying” destroyers. The US administration has threatened to bring down any ballistic missile fired, suggesting a firm “red line”. The problem with the “red line”, as envisioned by retired-General Stanley McChrystal is that if you’re not prepared to enforce it, you lose credibility both from your enemies and your friends. The Trump administration is surrounded by strategic geniuses as NS Advisor MacMaster and Secretary of Defense, James Mattis, we should not expect empty threats. Will the DPKR call the bluff an issue a ballistic test? In addition, the “38 North” intelligence analysis center has published a report widely presented by news outlets, as showing heavy military activity at the Punggye-ri nuclear testing center. This facility was built with an underground storage capable of withstanding nuclear blast. This suggests that the DPKR is locked and loaded to launch a nuclear test; enough to defy the international pressure and afferent military threats, but also sufficient to show strength on a symbolic date and tense context. If US and China fail to respond to a nuclear test, then the carefully build-up power in this episode will slowly deconstruct and fade. However, there is no precedent for nuke testing on the “Day of the Sun”, which should serve as an secondary input, yet it is recommended to watch out for the mushroom cloud; even if conducted underground, a nuclear test will still cross the “red line”. However, Vice-President Mike Pence is expected to conduct a visit on Sunday in Seoul. There are several factors why this potentially is an altering input. First of all, a top level visit will not be conducted if the administration expects that a possible military even will occur, regardless of being a limited campaign or a war. Secondly, there are rumors of a significant South Korean opposition towards a military option against North Korea, given their close proximity, Seoul has major concerns. Mike Pence’s visit could be costumed to address those issues. Also, the VP visit could be canceled if a military action is eventually needed or commenced, which leads us also to another possible outcome: peace and de-tension. There is also unconfirmed intelligence that Russia has moved anti-air defense systems in Vladivostok [source] and that an “endless” convoy of Chinese infantry armored vehicles are heading towards the DPRK border. [Source] The footage is from March and the movements have been geolocated as having place around the Chinese border with North Korea, more exactly, near the town of Dandong. The hypothesis of “hot air” is as strongly as the other ones, but it can be highly unlikely due to the current context. Evidently, the military build-up and the tense political climate could blow off and retain the status quo, yet the current political climate and the tense military build-up is nothing comparable to past situations: not even to 2013, when DPKR attacked a South Korean island. Regional allies are under a constant vital threat, as time passes Kim’s ballistic capabilities will only improve whereas his nuclear cache will also enlarge. The situation is not funny anymore, DPRK is closer than never to become a real offensive threat to the US homeland. Not to say that these continuously fueled tensions are endangering one of the most emerging strategic vectors: Asia-Pacific. The strategic patience has outgrown, it’s not an option anymore, widely given the imminent threat posed by DPKR’s ballistic program that potentially, in two or three years could reach California. Letting an open-hostile regime develop nukes and then acquiring the means to transport them to your turf is a slow but steady suicide on watch. Recent history is not kind to US plans to pacifying North Korea, neither George Bush nor Barrack Obama were capable of solving the issue, it’s also possible that Trump won’t manage as well, yet his approach is uniquely different which can pull out a surprise. The historic Chinese shift towards an anti-Kim position is also a strong input for a showdown notably given Trump’s openness to unilateral action, in accordance to the widely-misunderstood strategic doctrine, labeled by the press as being isolationist, but actually potentially quite neoconservative: “America First”. However, there is always a persistent uncertainty coming off these uneasy alliances, as is this case with China. It is not impossible for the Chinese to completely change their policy and return as the protectors of North Korea, outmaneuvering the US; it dependents on how things evolve behind close doors. We can only assume that there are multiple ways of negotiating between Pyongyang and Beijing, an advantage that the US does not posses. The situation is dynamic and fast-shifting, new circumstances and signals appear on a daily basses, the tone changes in regards to what’s discussed behind close doors. Still, a Chinese betrayal is moderately-unlikely at this moment and would in the best case only stall, but not stop, firm actions against Pyongyang. America First has the remarkable preeminence of reflecting a contemporary and publicly assumed realistic doctrine that holds similarities to the neoclassic interpretation of raison d’etat; likewise blended with the preemptive post 9/11 engagement and with Barry Goldwater’s “Peace through Strength”, also applied by President Ronald Reagan. The settlement of the North Korean issue is critically needed, whether this real and actionable opportunity does come to practice is still bounded in the hypothetical realm; negotiations and discussions are still ongoing behind closed doors while plans are outlined, weapons are armed and diplomats are on the watch, the Asia-Pacific concert headlined by Trump and Xi Jinping is still yet to debut. The ball is in Kim’s court. Road to Raqqa: Are we there yet? No Comments on Road to Raqqa: Are we there yet? INTELLIGENCE ANALYSIS – The Euphrates corridor, as any waterway in the Middle East (and not only) has been a catalyst for urban settlement, agriculture industry and energy development. Crossing Syria from its north-western corner in Aleppo governorate all the way down to Iraq’s Anbar region, the Euphrates River has been used by ISIS as a blood vein to spread as a tumor in a ravished body. Through its road to Iraq, the Euphrates also crosses the sparsely populated but oil-rich region of Deir-Ezzor; it’s importance being critical for trade, exploitation and transport optimization. Moreover, capitalizing on the strategic importance of the river and its surroundings, ISIS has made its self proclaimed-capital in Raqqa since 2014 – after it ousted the Free Syrian Army and Jabhat al-Nusra that initially liberated it in June 2013 from the Syrian Arab Army, following the escalation of the Revolution into the Civil War. Life after the Turkish Liberation in Syria: State-Building, Safe-Zone or Annexation? No Comments on Life after the Turkish Liberation in Syria: State-Building, Safe-Zone or Annexation? ANALYSIS – This assessment presents the situation in the areas liberated by the Turkish Armed Forces (TSK) and its local allies (Free Syrian Army, Syrian Turkmen Brigades, Ahrar ash-Sham) as affected by the post-conflict Turkish-led reconstruction. The multi-ethnic character of the Aleppo Governorate, comprising of Arabs, Kurds, Turkmens, Assyrians, Circassians and Christians, is a magnet for land claims and geopolitical ambitions, energized by the dramatic changes in the Syrian Republic – ravaged by a perpetual multilateral civil war. You probably know this region for the infamous battle of Aleppo, the largest city of the province and the stronghold of the Rebellion; this region is far more than that. Let us not forget that this is the boiling point for Syria’s Kurdish self-determination and for reactive Turkish endeavors, it caused. The purpose of this analysis is to swiftly summarize the context of military intervention launched by the Turkish Armed Forces (TSK) since late 2016, and overview how the Turkish administration there affected the lives of the local population and the overall dynamic: Did it improve? Did it worsen? In order to determine such a conclusion, this analysis also contains a case study of Jarabulus (Cerabulus in Turkish) – the first city liberated by Operation Euphrates Shield and under the longest Turkish-led administration. In addition, this assessment, purposely provocative, draws prospective conclusions in regards to the future of the captured buffer zone, outlined in several hypothesizes: i. State Building ii. Safe-Zone (limited) or iii. Annexation (directly/ indirectly).